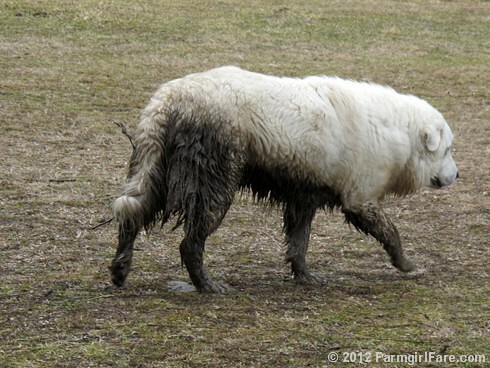 Farmgirl Fare: Monday Dose of Cute: What the. . .
She's usually the clean one. © FarmgirlFare.com, home of the Daisy in Marta Beast's clothing. Haha! She's like, "Wassup, Bear, you know you're jealous!" Oh my! What a dirty dog! 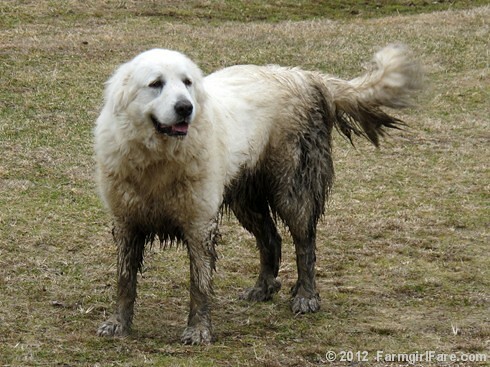 One of my daughter's Pyr's is forever getting in the mud or the water trough. She loves being in Lake Huron too.....what a hoot ! Did she do that on purpose? Our Maremmas both hate getting wet. Rain's fine, snow is even better, but any kind of puddle that even loosely resembles a bath and they're off on a dead run. She doesn't know she is two toned. It's hard work being a working gal. 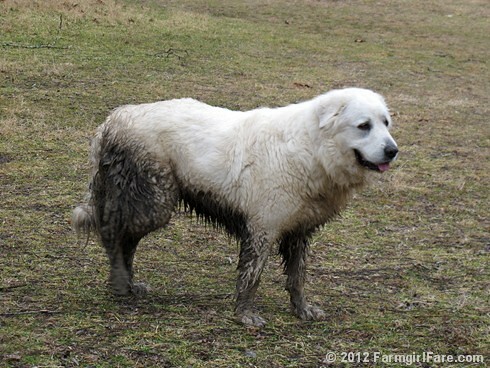 By tomorrow the mud will have dried up and majically dropped off and Daisy will look like a white dog again. 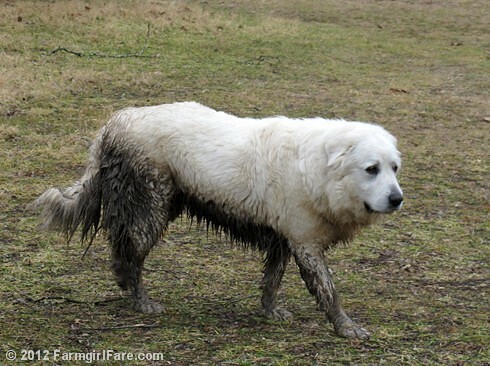 Prys have amazing self cleaning coats. hahahaha!!! that's funny, she's like, "things were getting too dull, I need to change things up a bit!" Good grief! That is so funny! You kind of wonder just what was she thinking????? Love it! After our newfie has been wading in his pool or just all around wet he decides he needs to come in to the house! It's like being run over by a freight train.